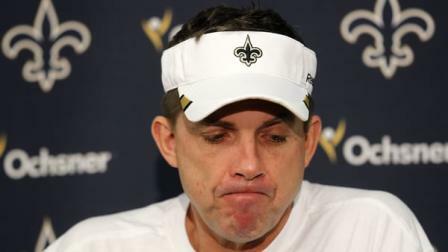 The NFL came down on the Saints, specifically on their coaching staff and GM. The punishment for Sean Payton and the others involved is outrageous. Payton will be suspended for a complete season, while Greg Williams, the D Coordinator who put the entire system into action, is suspended indefinitely. The league fined the Saints $500,000 bucks and took away their 2nd round picks in the next two drafts. As I agree that some type of punishment was necessary in this situation, I believe the severity of the decision is way too extreme. Payton was ultimately responsible for monitoring his team and knowing what was taking place in the locker room, so he needs to accept some fault. However, it is commonly known that their are “bounty-systems” in place in many NFL locker rooms for decades, and for the league to come down this hard does not make sense to me. The real problem is that Payton and GM Mickey Loomis lied to the league office about their knowledge and told them that they had put a cease on the practice. Roger Goodell was made to look like a fool, and now he’s flexing his muscle and making an example out of the Saints. When I first heard the story, my initial response is that this issue was being well overblown. NFL players are paid to hurt their opponents, and the amount of money paid out in these bounties does not compare to what the league fines a player when they make an illegal hit anyway. If players are playing within the rules of the game and making legal tackles, I don’t see what all the hype is about. In my opinion, what Bill Belichick did in the “Spy Gate” scandal was far worse than this. He cheated to gain a competitive balance in a game. His team won unfairly because they knew what plays the opponents were going to run. This seems to me to be far more damaging to the NFL game then players wagering with each other to knock out opposing players, within the legal framework of the rules. Belichik was fined $500,000, suspended ZERO games and the Patriots were fined an additional $250,000, but if you compare that fine with the fact that Payton won’t get paid the $8 million he was owed this season, the penalties don’t seem in proportion at all. Maybe I am just a bitter Jets fan who hates the Patriots, but I firmly agree that cheating is not that much less of a black eye on the game then the Saint’s bounty system. Like I said, I do agree that the Saints should have to pay a price for what they did, and if it was close to the Belichik punishment, I would have been satisfied. Goodell has to be consistent though, and I think it’s clear that in this situation, he failed. This entry was posted on March 21, 2012 by NY Bobby. It was filed under Football . I agree with you that the two situations are entirely different. However, that does not mean they are unable to be compared. There are many similarities in the two cases. It is is the same commissioner who is penalizing the teams. In both situations, coaches put in a program that was unprecedented in the history of the NFL, and both situations were leaked to the NFL Office. In both cases, the NFL is trying to rectify a program that gives the league a black eye. In both situations, the coaches and franchises were punished. With that in mind, Sean Payton and the Saints have exactly a 16x bigger price to pay. Payton is suspended for 16 games, Belichik 0. Payton loses 8 million, Bill half a mil. I still believe cheating to win is worse in far of integrity. However, I never said that the Saints don’t deserved to get off Scott Free, just that this penalty seems as if they are being scape-goated for everything you listed in your reply. Class action lawsuits and doctors and coaches rushing players onto the field are all a serious problem. But did the Saints cause that problem?? How many of the lawsuits are tied to plays that the team paid bounties on?? I don’t think that information is available because I’m not sure if it even exists. That information is probably not even known. The point I was trying to make was more about how Goodell handles negative PR rather than game integrity. Goodell has to do what he feels is good and bad for the sport in the public realm. He seems to want a tamer football that appeals to all sorts of people. More people watching football means more sponsorships and more $ for the league. Spy gate does not have far reaching affects outside the sports world. Bounty gate and specifically the physical harm piece has the potential to have negative effects outside of the NFL. In the public eye it is one matter to tackle someone as a normal part of the game, it is something else to tackle with intent to do bodily harm. The extreme fines and suspensions were a political move on Goodell’s part. Good point, I agree with that aspect, doesn’t mean I agree with the overall severity of the fines, but your explanation makes a lot of sense. The simple fact is that the league has had class action lawsuits brought against it by former players with traumatic brain injuries and concussions. They say the league neglected to inform players as to the risks of coming back to play too soon after serious hits to the head. The extreme fines and suspensions while very extreme, is meant to be a warning to other players, coaches, and programs. The NFL wants to show that it protects its players, because of this negative press in recent years. I think that in the face of all the damning evidence including emails, oral accounts, and admissions Goodell had no choice but to do something very drastic. As far as “spy gate” is concerned I think you are comparing apples to oranges. Cheating is one thing but aiming to inflict bodily harm is an entirely different story.